THE FOLLOWING HAS BEEN MODIFIED SINCE THIS WAS FIRST POSTED BACK IN JANUARY. PICTURES HAVE BEEN ADDED, ETC. 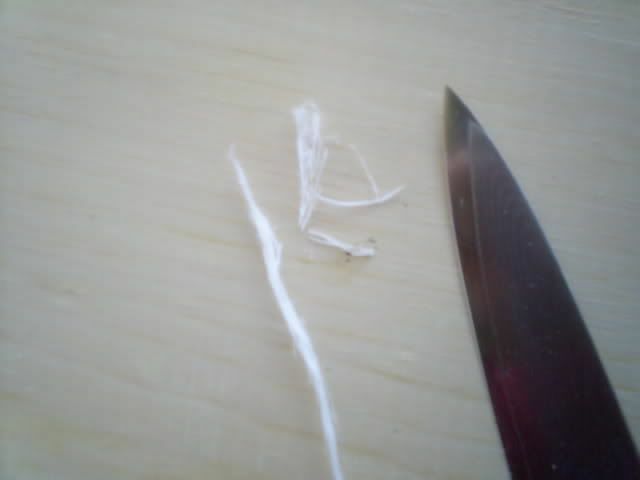 First, I pound and separate the DRY sinew into strands. It doesn't matter too much if you pull apart the sinew from the middle or the ends, especially if the pieces are on the short side. 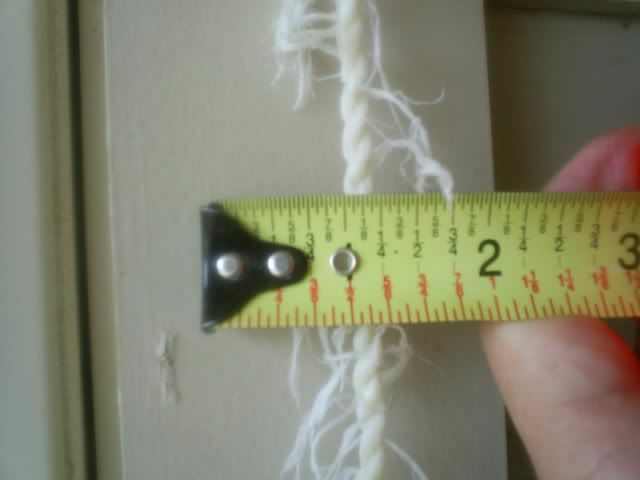 The strands are about 1/16 of an inch wide (or less) with no hard spots. I do not "comb" the sinew. I try to get the strands as consistent as possible. This makes it easier to splice in the correct amount. 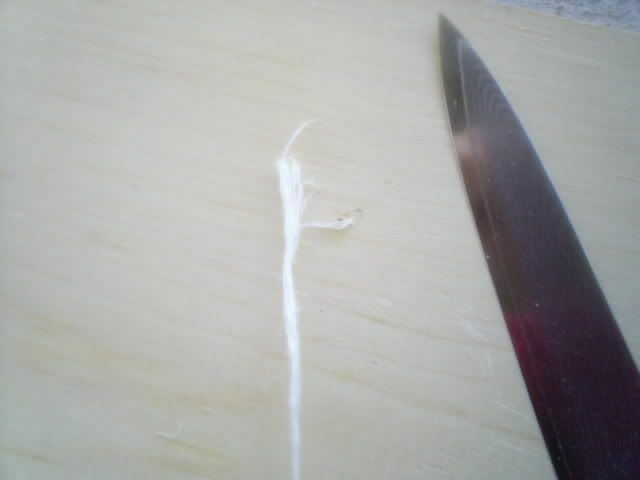 Once I have a good pile, I sit down with my dry sinew and a sharp knife and cutting board. 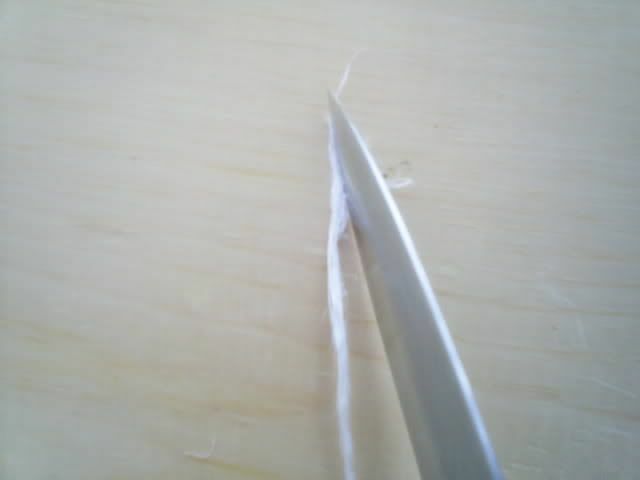 I trim any bulky ends (of the stands) off with the knife. I grab some strands, dip my fingers in the water and moisten them a bit. 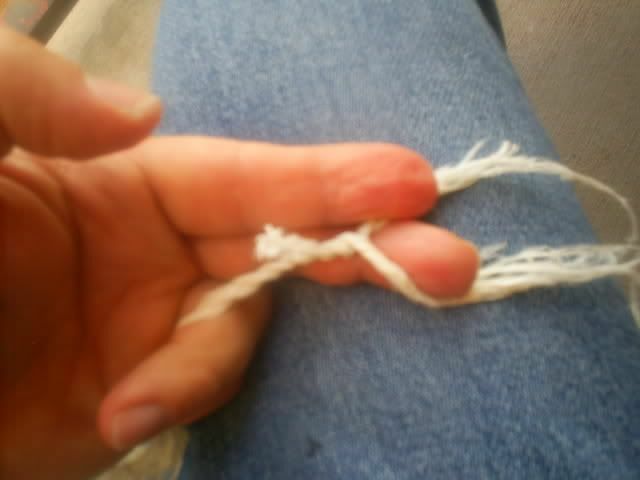 I twist the strands HARD and add strands based on experience and the desired strength of the string. 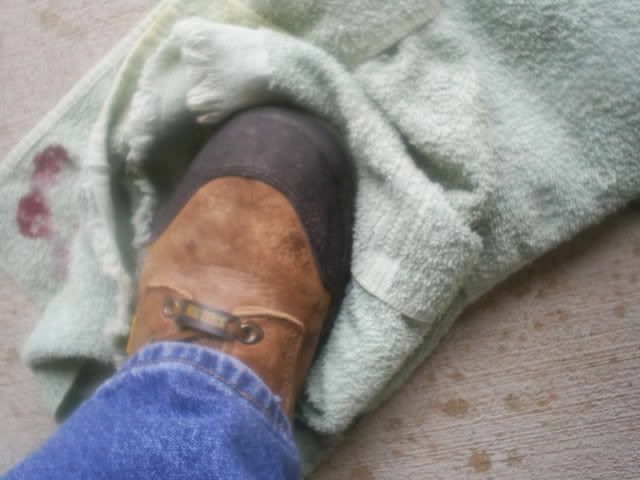 If you do this when the strands are soaking wet, you can't get a good grip and you'll end up with a loose twist and a lumpy string. 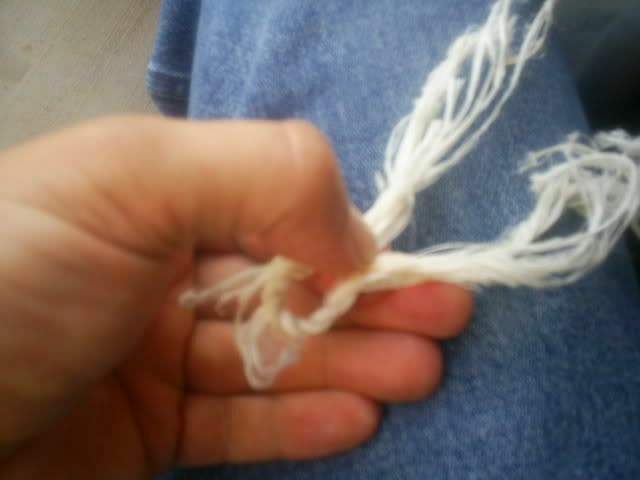 The harder the twisting force, the more accurate I can be with the string diameter. 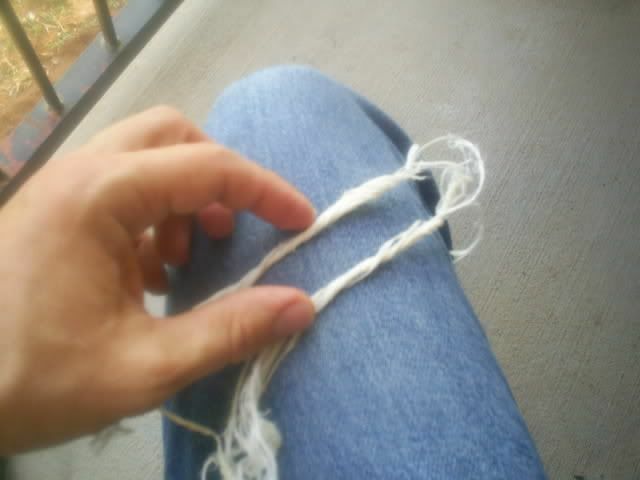 As I'm reverse wrapping the string, I try to remember that at this initial stage, thicker is better. 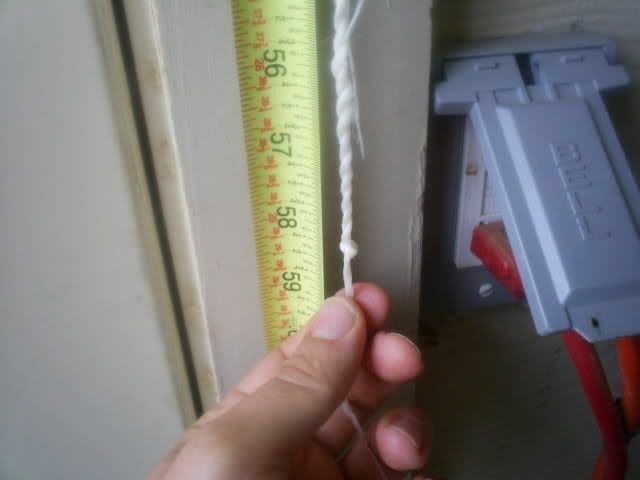 I've started may times with too narrow a string and had to start over (no fun). 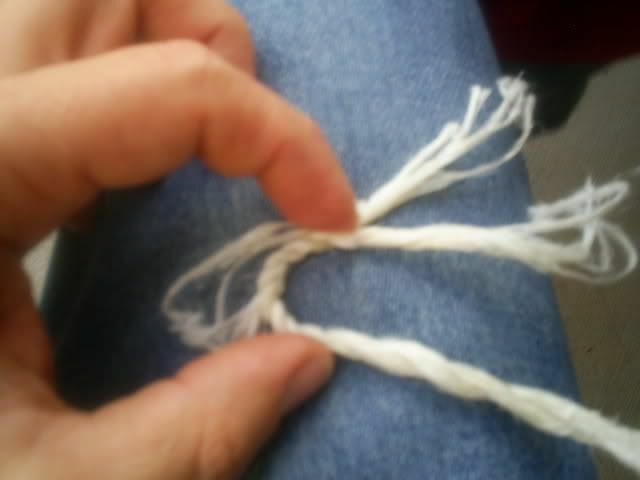 From my experience, I find that a two-ply string is easiest and fastest...although a three-ply looks better. Here is a video of someone using the same technique that I use for twisting the strands together. 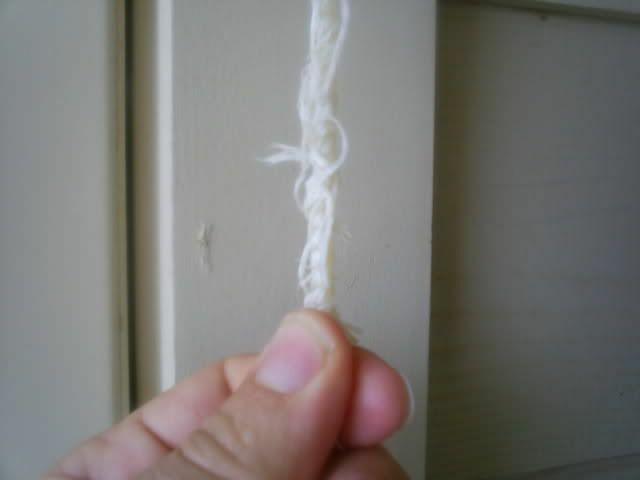 The difference, of course, is that I add splices....and I can't make the string nearly as fast. 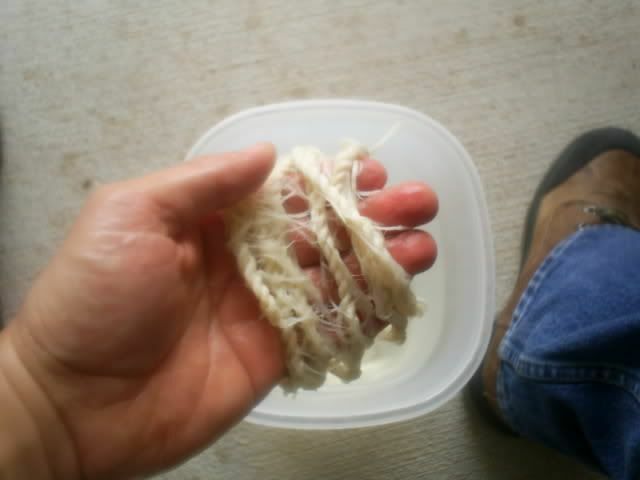 As I add strands, I moisten my fingers in the bowl of water and apply water sparingly to the sinew. 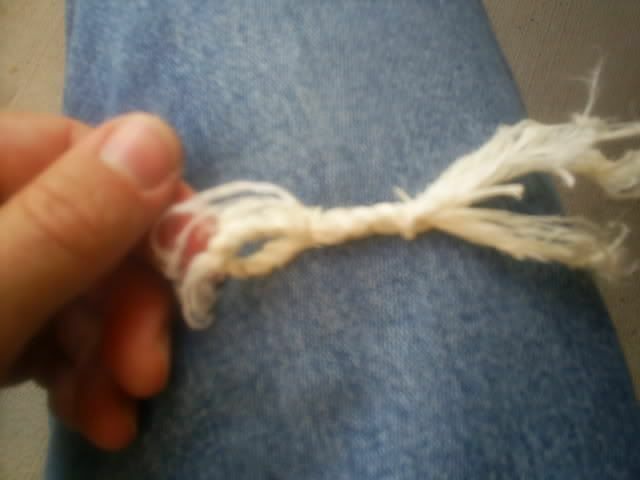 The loop is the most difficult part of the string. 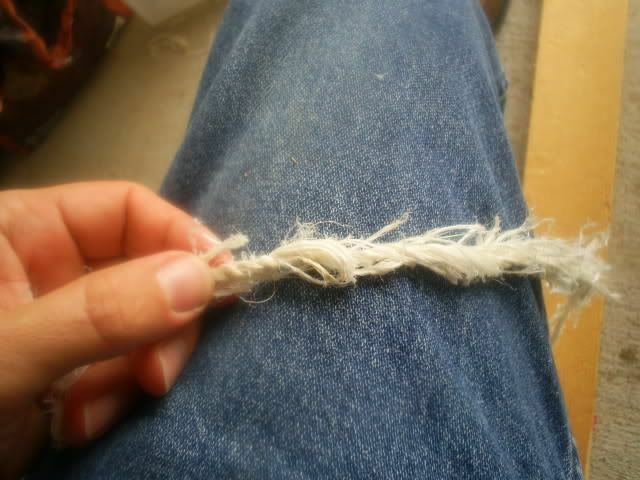 Here I've added quite a few splices to maintain the thickness of the string at the base of the loop. Sometimes I cut away strands so that this area isn't so thick, but it's easier to just add lots of splices and then taper the thickness down slowly. 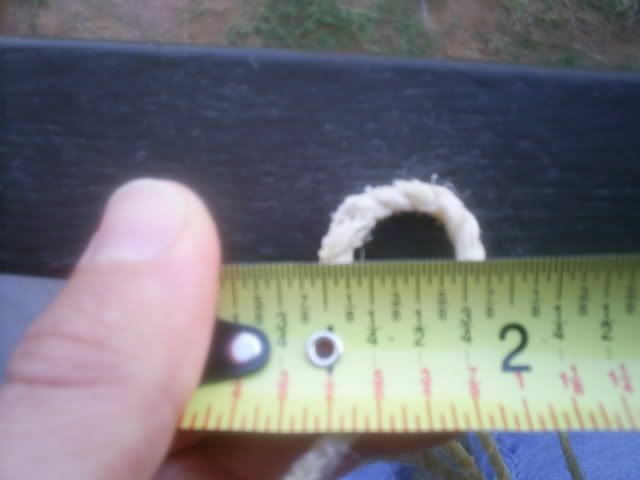 Here is the string laid down next to a completed bow (for size reference). I DO NOT TRIM OFF THE LOOSE ENDS AT THIS POINT. 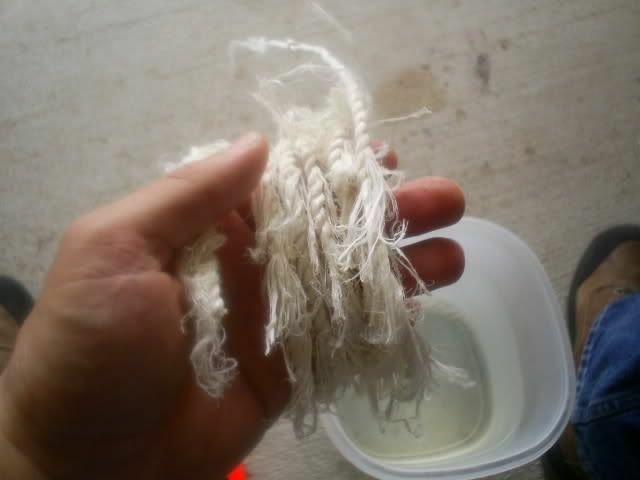 I roll up the string, dip it briefly in the bowl of water, and then remove the excess water. 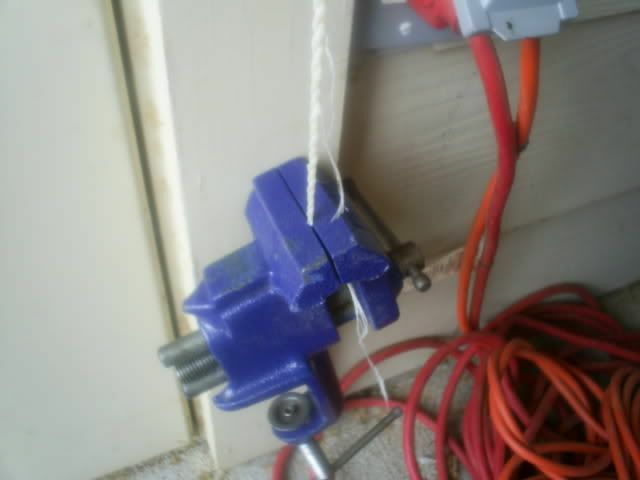 and clamp a weight to the end of the string (about 4lbs in this case). 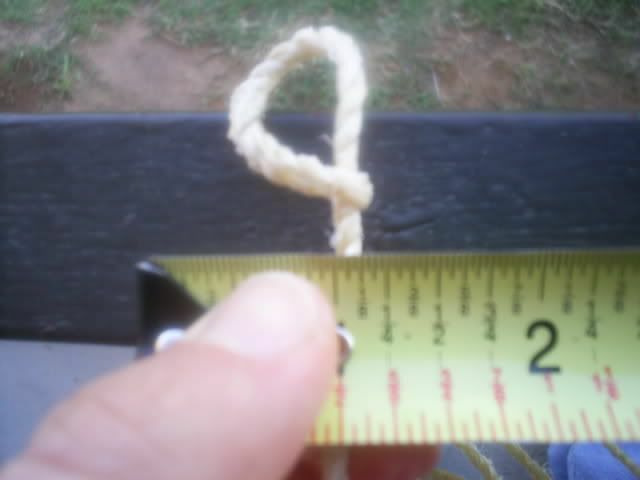 The string's original length was 58" before the twisting. 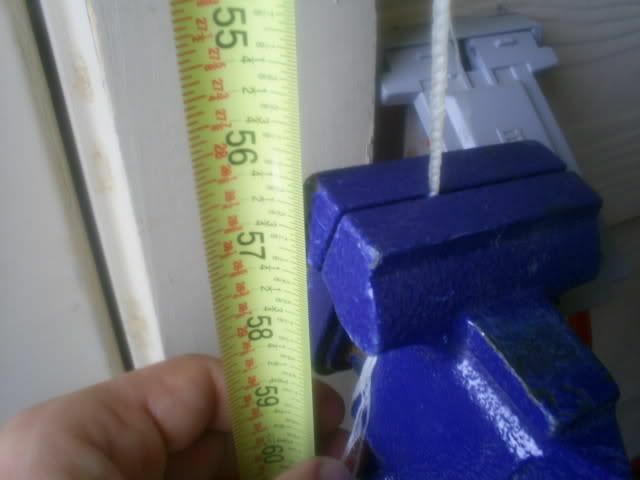 And about 57" after the twisting and clamping the weight to the bottom. 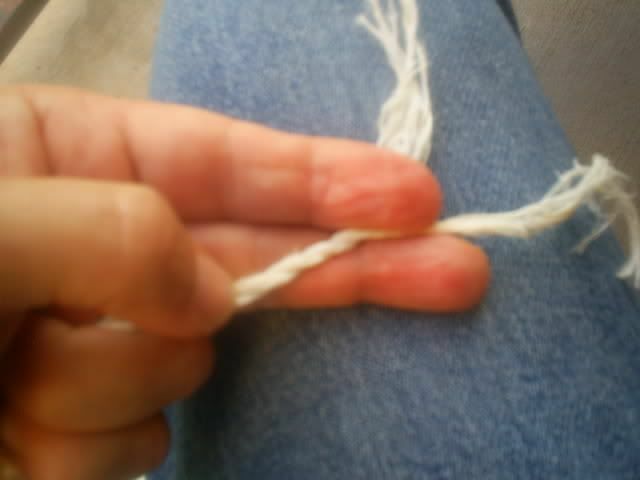 I then pull the loose ends of the strands away from the string so that it will dry faster. I DO NOT TRIM THE LOOSE ENDS AT THIS POINT. 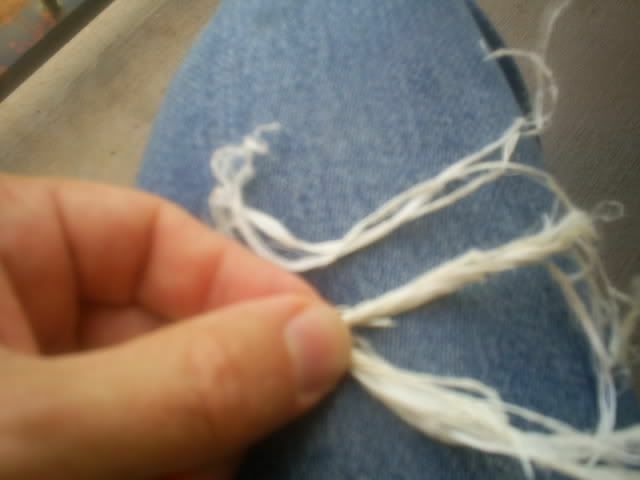 If the loose ends are trimmed off, the string might unravel as it stretches and dries. 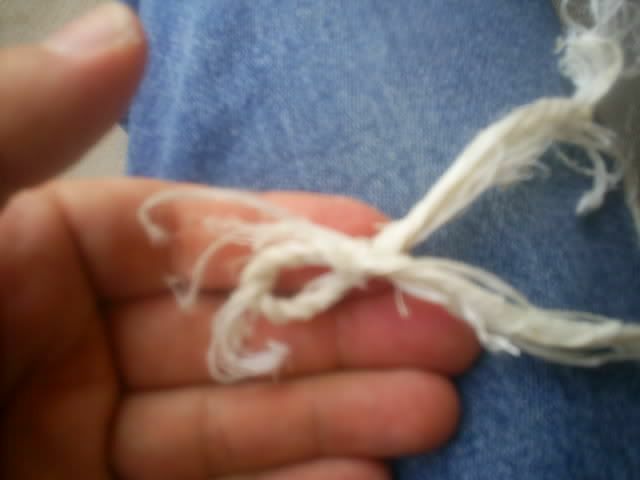 Once dry (overnight), I take down the string and clip off the loose ends with fingernail clippers. 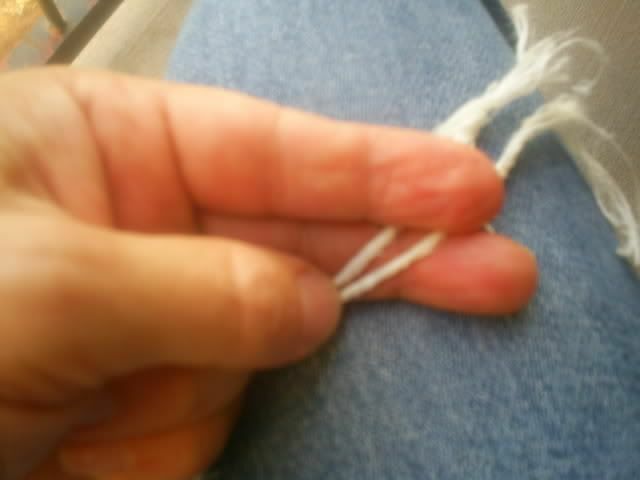 Some of the strands may be stuck to the string: so I just rub the string until they pop up. I use a lighter or candle to CAREFULLY burn off any remaining "hair" (Note: I don't burn off the "hairs" anymore). About 3/16" just below the loop. 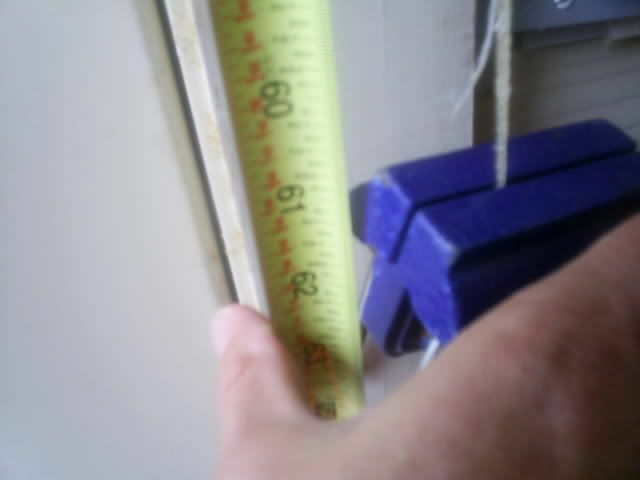 About 1/8" wide. 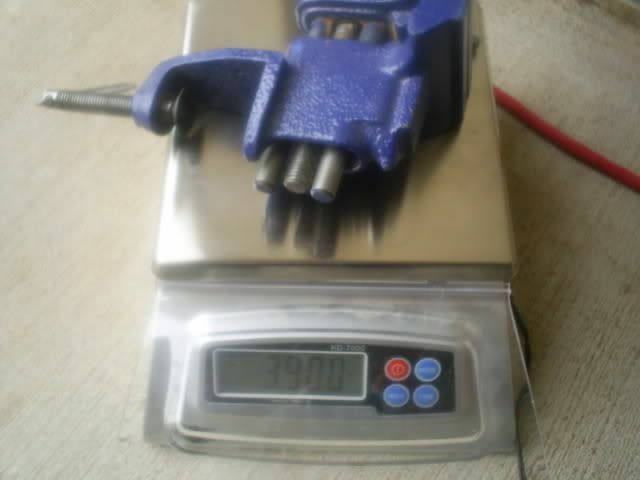 This will work for bows up to 60# draw weight with no problem. That's it. Now I test it. I recommend shooting a new string on a sunny day (for starters) and at half draw. After a few shots, I gradually increase the draw until I've reached full draw and shot the bow about 50 times. 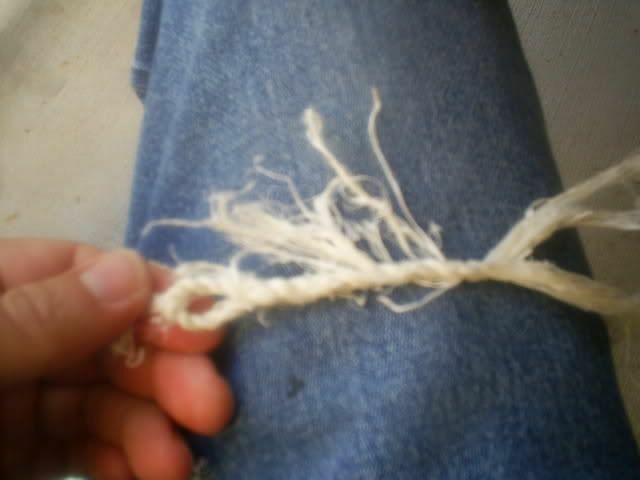 This process is what I call "stressing" the string. After the string has been stressed, moisture will not affect it so much and shooting on humid days is not a problem. However, if you accidentally get water on the string, unstring the bow immediately and LET IT DRY COMPLETELY before shooting again. The string can be oiled (to make it softer) or it can dipped in hide glue (to make it stiffer) but I don't recommend either of these things. You could probably add a coat of beeswax to the string, but I'm not sure that this will make it waterproof....and it will certainly add weight to the string. I've never used beeswax or any other coating on my strings. Sinew strings wear out more quickly that any other artificial strings I've used (nylon, Dacron, polyester) but there is a special feel in these strings. They are easier to grip with your fingers, they become soft in the area where you nock the arrow, and they are very light in weight. Thanks for sharing... Sure could use some pictures along with this. 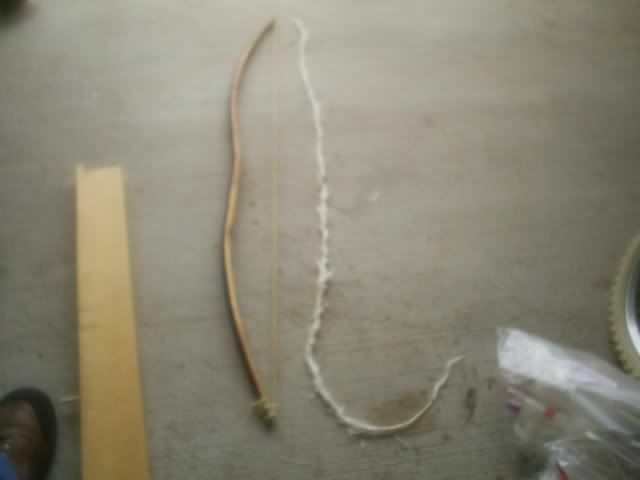 I've never had a string break on a bow, although I have broken a string or two during the drying under tension process because I added too much weight. And yeah, I've got to post some pictures...and maybe make a video. 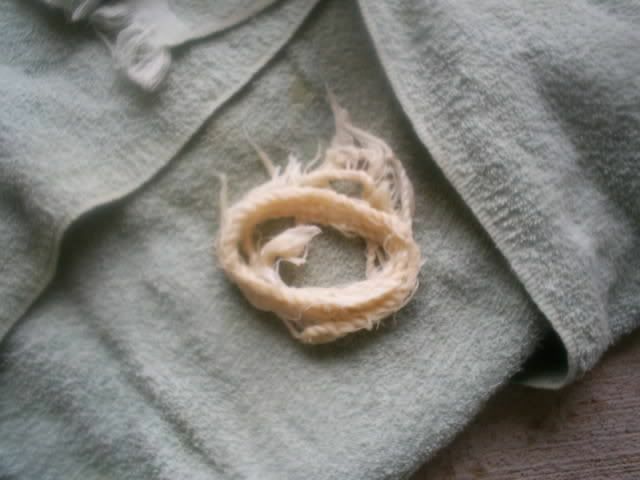 I've tried soaking the sinew but I ended up with a very irregular string each time. -They stretch. 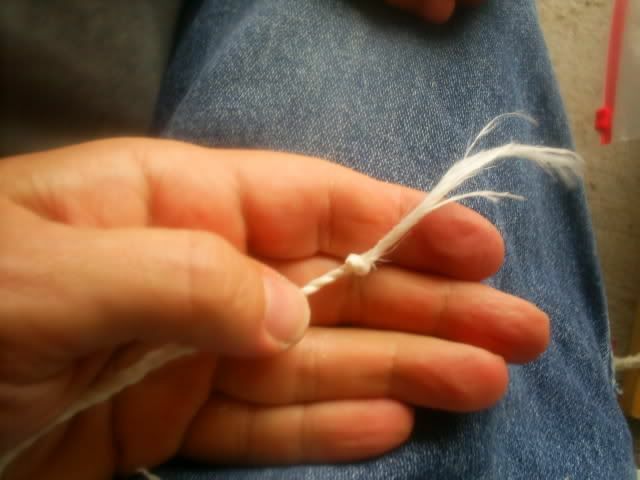 Sinew string works fine on short bows, but long sinew strings amplify the drawbacks of a flexible string. -They expand and contract with changes in humidity. -They are food for various critters. -They look funny. They are off-white in color...and they look like clothesline from far away. -They also get "shaggy" with constant use. 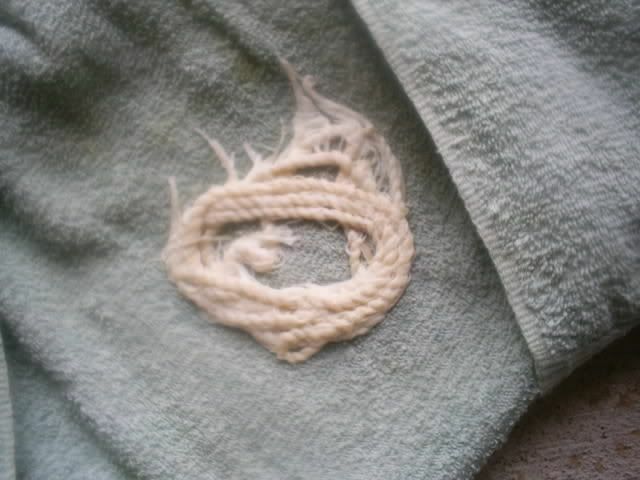 If you're a neat freak, stay away from sinew. I am not familiar with the reverse twist. 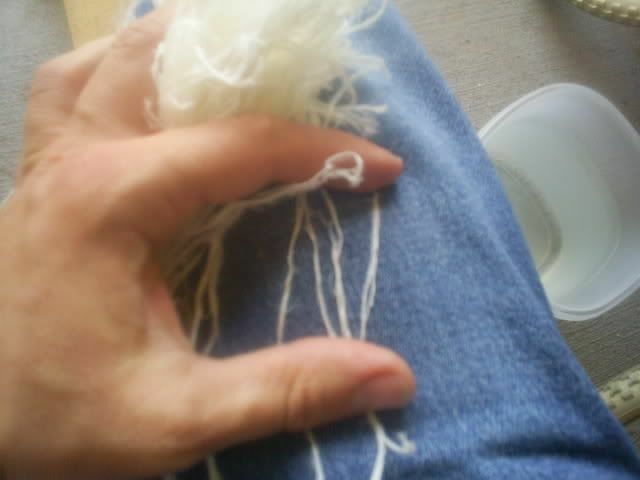 I always make flemish strings. What is the reverse twist? 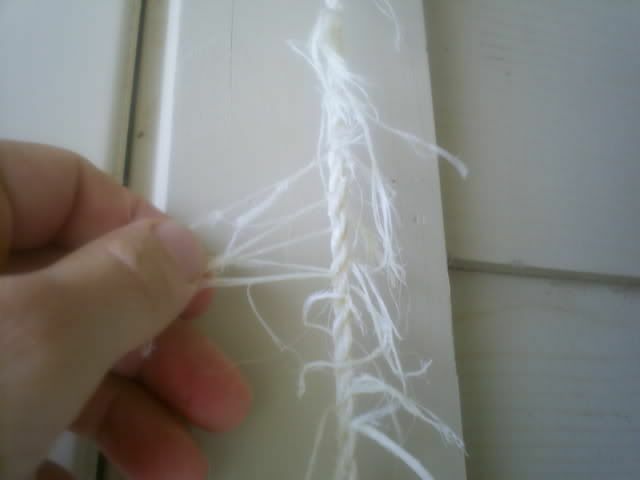 Ok, Then I just twist up two strands of sinew then make a flemish string? 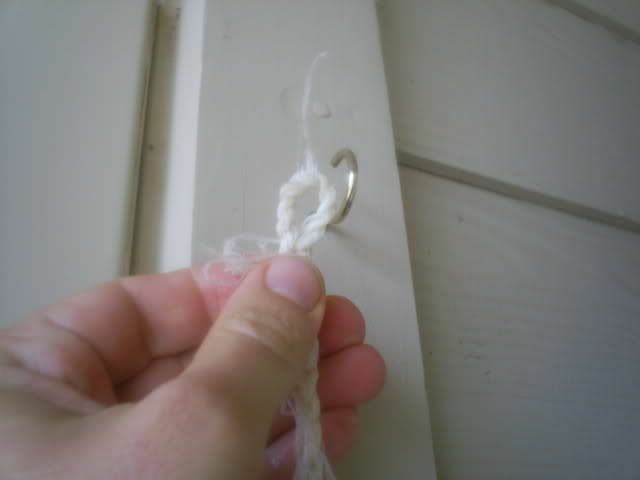 Just keep twisting in the way that you twist the loop. It takes a while. 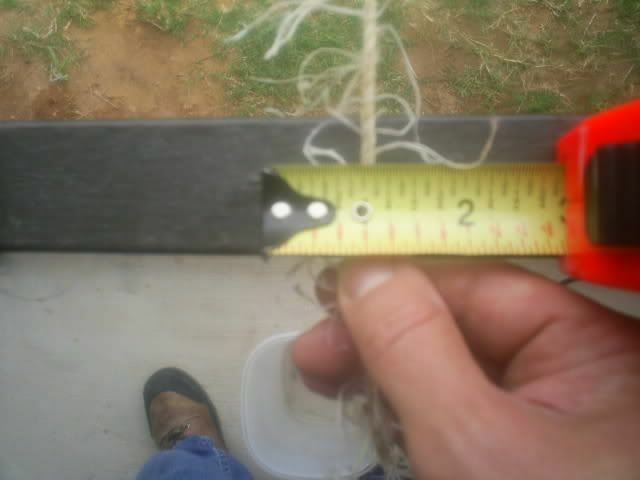 I modified the first entry and posted some pics that I took while working on a bowstring for my "Sinew Backed Double Curve Bow" thread. 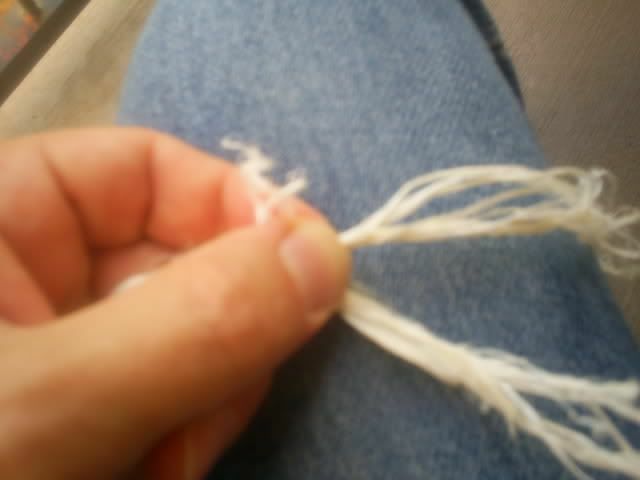 I'll post more pics as the string progresses. I ran out of daylight....so I'll try and finish the string tomorrow. Thanks for posting. I need to get my hands on some sinew now. 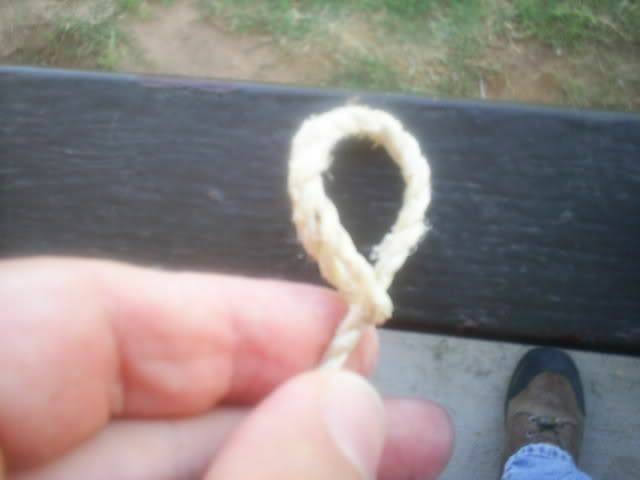 Thanks for the excellent info and advice on making the sinew string!!! 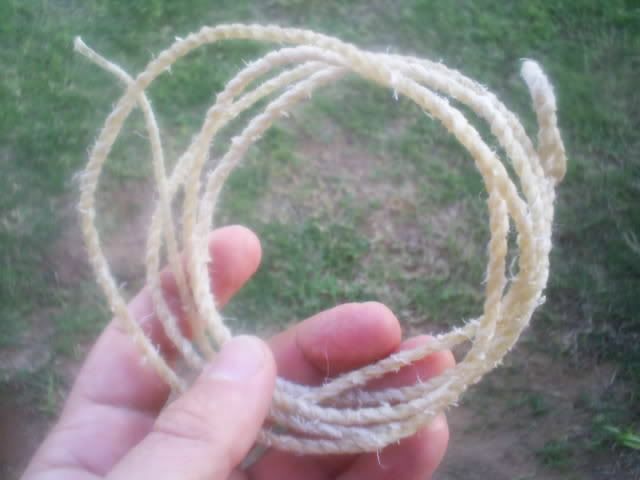 I used this how-to in order to make my first sinew bow string. I then was able to make another in short order. Both are functional. I was elated. I love finding this kind of quality help and instruction on this web site. It keeps me coming back. Thank you for kind words, m'friend. Glad to see this thread is still alive. It took me a while but I also have a youtube video series on this topic. The video explains the process of the actual "twisting" better. (shameless plug...heheh). Again, thank you. made my day. 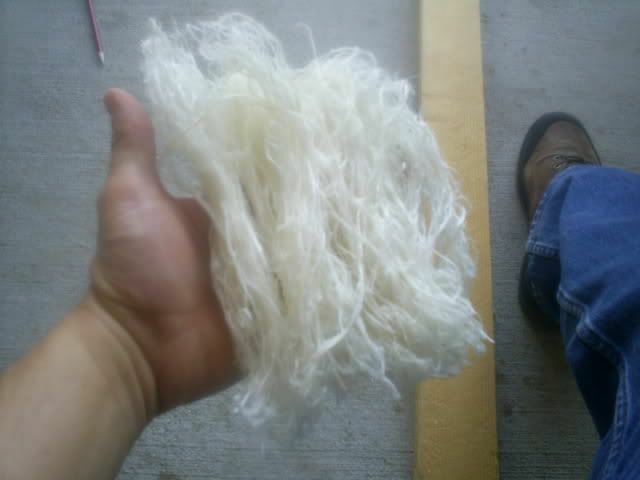 Know anyone who sells sinew strings? Need 58 to 64 in strings.